Extract form [!] The diary of Ebenezer Townsend, Jr.,. supercargo of the sealing ship "Neptune" on her voyage to the South Pacific and Canton. Arranged and indexed for the Hawaiian Historical Society by Bruce Cartwright. Ebenezer Townsend Jr., of New Haven, observed surf-riding in Hawaii in August 1798; possibly the first account from Waikiki, the first by a merchant, the first by an American, and the first use of the term surf-board.. The son of the ship's owner, Townsend Jr. sailed as the super-cargo aboard the Neptune, the three year voyage reaping a fortune for the owner, investors and the crew. Leaving New Haven with no cargo, the Neptune harvested 80,000 seal skins from islands off the coast of Chile which were then sold in Canton. After loading a cargo of Chinese tea, silks and nankeens, luxury goods for the America market, she returned home, via Hawaii. In the rush by to replicate Neptune's success, the South Pacific seal was exterminated by 1817. Anchoring about two miles off Waikiki, on landing Townsend observed both sexes were expert divers and swimmers, on one occasion reporting one woman swimming from the beach to the Neptune. In landing in a heavy surf they were expert body-surfers, going in on the top of the third roller, the heaviest, with a quick velocity and carried well up the beach. Remarkably, Townsend was already familiar with this technique, it was exactly as I have seen the negroes at Turks Island, in the West Indies. At Waikiki, the swimmers sometimes make use of surf-boards, which are about their own length and floats them lighter. By implication,Townsend observed the surfers of Waikiki riding prone. First published in the Papers of the New Haven Historical Society, Volume VI, 1888. Reprinted in 1921 by the Hawaiian Historical Society (Number 4), in a limited edition of 500 copies. 1756 Philip Aubin : Surf Riding in the Caribbean. Extract from Shipwreck of the Betsey ... in 1756, in Jean Desperthes: Histoire des voyages, [Paris], Volume 3, 1789. The voyage of the "NEPTUNE" around the World in 1796-99. The Diary which follows this introductory notice I had the pleasure of reading before the (New Haven) Historical Society in 1888. 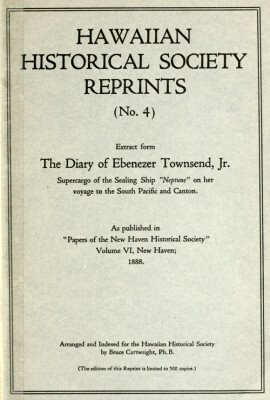 Mr. Ebenezer Townsend, the principal owner of the "NEPTUNE" and the projector of the voyage, was at the time one of the most - possibly the most - extensive ship owner in New Haven. His vessels sailed to many of the great shipping ports of the world, and a large fortune had resulted from his commercial adventures. Mr. Townsend fitted out the "Netune" for a sealing voyage under the command of Daniel Greene, a veteran shipmaster, strict disciplinarian and an honest man. The Ship's Company consisted of 45 young and sturdy Connecticut men. She carried an armament of 20 twelve-pound guns and was called a fast sailing ship. The "Neptune" was 350 tons burden, and was built in this city (New Haven) at the Olive Street Ship Yard. From this port (New Haven) the "Neptune" sail'd for the Seal Islands in the South Pacific (Massafuero, Massatierra, etc. ), and after killing and salting down 80,000 seals proceeded to Canton, where the skins were sold at a price which gave the ship a gross freight of $280,000. A cargo of tea, silks, nankeens, and China ware was loaded, and the "Neptune" came home to New Haven after an absence of about three years. Early in the morning we were close in with Wahoo (Oahu), off Diamond Hill (Diamond Head), when the canoes began to visit us. We steered along NW by W until Diamond Hill (Diamond Head) on Whitreter Bluff (Waikiki Bluff) bore S 72° E per compass, when we anchored in ten fathoms, sandy bottom with small shells and scattered coral rock. We anchored rather far out. a half miles from the landing. They being so expert swimmers, we frequently would heave a nail overboard, when they dive and scarce ever fail getting it, although they would some times have to go several fathoms. The girls dove as well as the boys. In landing in a heavy surf they manage exactly as I have seen the negroes at Turks Island, in the West Indies. The third roller, or sea, is the heaviest; they would go in on the top of it with a quick velocity, which would carry them well up the beach. They would land with the utmost ease where you or I would have drowned. They sometimes make use of surf-boards. The surf-board is about their own length and floats them lighter. supercargo of the sealing ship "Neptune"
on her voyage to the South Pacific and Canton. Geoff Cater (2017) : Ebenezer Townsend : Neptune Diary, Hawaii, 1798.